My heart was left with a gaping hole brimming with hope when I first encountered Human Again, Ingrid Michaelson's latest album released in 2012. What more could you ask for than perching on your favorite spot and listen to End of the World, Blood Brothers, Ghost and all other songs from the album, while enjoying the summer breeze? Since then I have this auditory thirst that only Ingrid Michaelson could quench. Thankfully I have Grey's Anatomy season finale to thank for, because it is in this episode that Ingrid Michaelson debuted a new single entitled Without You. In this song Ingrid shows us how to be strong and independent from a so called lover. Just take this bold line for example, "My life will grow, my love will go, my life will go, my love will grow without you." Listen to Ingrid Michaelson newest single entitled Without You. 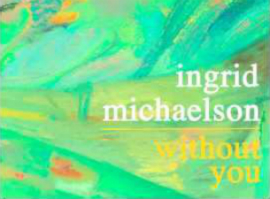 Without You by Ingrid Michaelson is now available at iTunes.